A few weeks ago my friend took me to see the Star Wars costume exhibit at St. Petersburg’s Museum of Fine Arts. Like myself, she is a huge Star Wars fan and has attended Celebration with me for a day each time it has been in Orlando. So this was a treat for both of us. Since one of my fellow Future of the Force writers already reviewed the exhibit, and since it’s awards season, I thought I’d feature the best costumes. Queen Amidala’s Senate address gown is one of the most elaborate gowns from The Phantom Menace. Its beaded dress and heavy velvet robe are not just elaborate, but regal. Add in the headdress and it’s one hell of a statement piece. This dress demands attention and respect. You instantly know that if a woman walks into a room wearing this, she is Queen. Not to mention the dress alone had to weigh several pounds and the headdress another five at least. The headdress’s real world inspiration is Mongolian and the rest of the gown is inspired by other Asian countries with its beadwork and color. Mon Mothma’s dress from Revenge of the Sith is similar to the one the original actress, Caroline Blackstone wore in Return of the Jedi, but is more reflective of the state of the galaxy and her position of power at the time. It’s still white, but the fabric for the dress has a subtle raised floral pattern on it. The tabard over the dress is also white, but in an unadorned fabric. Her silver cord necklace is also present. The ensemble is simple, understated elegance, but it still commands respect and marks her as a Senator. It also is a stark contrast to the dark palette of Chancellor Palpatine clearly marking her as the future leader of the Rebellion, Palpatine’s polar opposite. When I turned around after I finished admiring Mon Mothma, Bail Organa, and a costume I’ll mention later (spoilers!) I was excited to see my favorite leading man, Han Solo and his ever present Wookiee companion standing before me. How could I not choose them? I’ve met Peter Mayhew, but he was sitting, so standing in front of his costume really drove home just how tall the man is, especially since I’m a hair over 5ft and my friend is an inch shorter than me. There was concept art on the wall across from the costume, and you could definitely see the one used for Zeb. As for Han, I can’t quite remember which version of his costume this is, I know it’s not Empire, I think it’s his Jedi one. But it also said that the shirt was originally supposed to have a Peter Pan collar and that Harrison Ford adamantly refused to wear it. All I can say is thank the Force he did. Can you imagine if it had a Peter Pan collar? Leia as Boushh wins this hands down. I stood several minutes in front of the costume looking at the different suede and leather elements. From the tunic to the studded gloves to the stained pants. In my fascination, I forgot to snap a photo! I’m usually only a fan of elaborate costumes, but this one is functional and it protects the wearer from the elements. Plus, it’s Leia. This one goes to Luminara Unduli, the one Jedi featured in the exhibit that doesn’t wear the traditional robes. Honestly, if it hadn’t been for the lightsaber colors and the plaques, I wouldn’t have been able to tell Qui-Gon from Obi-Wan. And Mace Windu’s isn’t much different. But Luminara’s headdress, lace trimmed black skirt, and cloak made out of what looked like cut velvet stand out. I wish they’d had more of the different Jedi costumes to show the variety that some of them put into their wardrobes, especially the women. Luminara’s has always been a favorite though. I turned the corner and gasped when I saw Wicket using a Stormtrooper helmet as a drum behind a pane of glass. I’m pretty sure I let out a squeal of glee, which isn’t usually something I do. I’ve been a Wicket fan for as long as I can remember. He’s the most memorable little Ewok after all. Okay, it’s the only wedding dress, but I had to pick it. Anything made from a vintage bedspread deserves to be on this list. Dressing a Galaxy says the veil is a vintage tablecloth, and after looking at it closely, I can confirm this. I’m pretty sure I have a similar one at home. Besides, this is one of the most beautiful wedding gowns I’ve seen in any on screen production. And with it’s vintage elements and style, it looks like it belongs on one of the Crawley girls of Downton Abbey. Again, it was the only Handmaiden costume there, but even if it wasn’t, I’d probably pick it. While this one was in the Padme’s Journey section, this gown was actually worn by Kiera Knightley who played Sabe, the Queen’s decoy. I knew that when I looked at it, and thought “Oh, they even have one of Sabe’s costumes”, but it didn’t fully hit me until later that it didn’t belong in that part of the exhibit. But that’s beside the point. The plaque said the dress’s lace was handmade. Handmade. Let that sink in. And it’s not the only dress or costume that had a note about handmade detail. The feathered headdress may be elaborate, but the somber black color and gold accents are of a ruler in mourning for for what’s being done to her and her people, and maybe just a bit defiant too. This costume from Revenge of the Sith was specifically designed to hide Padme’s pregnancy. While not all of them did that well, this one did while maintaining the statement her previous costumes have made. The dress is a dark purple velvet with embossed designs in it and a hand beaded collar and cuffs. It’s elegant with a bit of regal element for a former Queen and the future mother of the famous Skywalker twins, but at the same time it’s not quite as elaborate as some of her other costumes. The headdress is one of the simplest ones, unfortunately it wasn’t in the case with the fabric swatches and final designs for this one. Plus, unlike the nightdresses and her Mustafar costume, it expertly hides the fact that she’s pregnant. Remember the other Senate costume I mentioned? This one definitely wins best in show in my book. I’ve always loved the blue color of this one. Its style looks like a courtier from a few hundred years ago, which, if you think about it, the Senators basically are Palpatine’s courtiers. The necklace and headdress are listed as being African inspired to carry through the theme that Padme’s costumes aren’t indicative of any one people, but that she is a woman of all people. Is it a bit over the top? Yes. But that’s why I love it. It’s satin and velvet and beaded. And those sleeves! There were many other costumes there, not as many as I was hoping, but enough squeals and gasps of delight were to be had by my friend and I as we wondered through. They were grouped accordingly by type: Royals, Military, Senate, Rogues, Jedi, and Padme’s Journey. Each was well lit and labeled what it was, the movie, and with a fact about the costume. For instance, I could have given Most Time Consuming to Make to Sly Moore’s costume because the plaque said her cloak was made of individually handmade and attached tassels. I wouldn’t have wanted to be the person tasked with that feat. As a fan of movie costumes, it was awesome to see them up close. Photographs in books can’t do some of the details justice. The last costume exhibit I went to (also in St. Pete) didn’t allow photos, but this one said we could take as many as we wanted as long as we didn’t use a flash. I don’t know if that was the museum’s policy, or that Disney Lucasfilm knew pictures would be taken anyway so they allowed it, either way I’m grateful. The next stop is Detroit, so if you are in the area I encourage you to go and check it out. 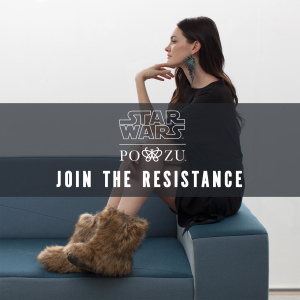 Previous PostPo-Zu Unveil New Han Solo Sneakers!Next PostBook Review | Star Wars: Ahsoka – Togruta Be True?